What is a Structural Sloped Sill? Not all vinyl windows are the same. Sloped sills differ from pocket sills the same way your driveway differs from your roof gutters. Watch what takes place the next heavy rain we get; the water that streams down your roof fills your gutters and pours out your downspouts – if they’re clean and clear. A pocket sill is like a gutter, its weep holes like your downspouts. When your pocket sill fills with dirt and debris over time, its weeps becomes clogged, forcing water to flow where it should not flow. Sloped sills like ours, on the other hand, use gravity to flush dirt and debris without your help! 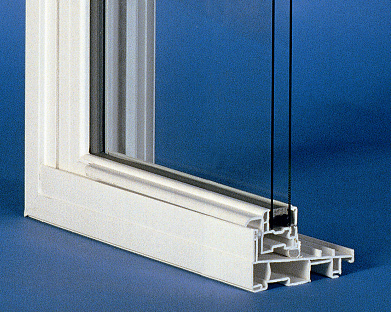 As for structure, too many lesser vinyl windows are designed with sloped sills that feature flat bottoms. Our sill, as this picture shows, features a smart design that works to stiffen and strengthen the profile for impressive structural performance. This enlarged photo also reveals our integral lift rail, our double-walled high sill dam, and our neoprene-sponge bulb-seal gasket compressed under the closed sash at the sill. The screen was removed for this picture.